Intermediate Routine from your home: For the intermediate routine start of with a light weight until you figure out what weight is right for you. You should be able to do 3 sets of 15 repetitions. By the end of each set number twelve should fell like you cant lift anymore weight. Make sure to rest no more than 30 seconds between each set. If it's super easy to do the 15 reps on the final set, then increase the weight. For your abdominal exercise do 3 sets of 20 repetitions. TIPS: Use a chair to practice; squatting is like sitting down. Make sure your knees do not align over the toes. TIPS: Place one foot forward, while your back foot will rest on your ball of your front part of your foot. You may feel a stretch in your back leg make sure that most of the pressure is placed on the front foot. When you lung down you want to make sure your knee does not go over you foot. Go down as far as a little passed 90 degrees. TIPS: Place feet on ball, lift glutes, lower back. TIPS: Place ball on body according to level. Do not let your back sink in. 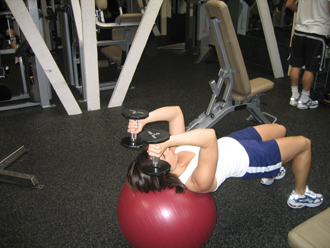 TIPS: Ball is placed on upper back, do not want to go past 90 degrees, relax your shoulders and bring dumbbells above your chest. TIPS: Shoulders back, chest out, pivot your body down from the waist. Elbows should remain close to the body, when you bring arms down leave some resistance. TIPS: Elbows pointed towards the ceiling, only come down half way and you should have full extension on the way up. TIPS: Place your hands on the side, palms facing up. You want to use natural range of motion. Make sure your wrists are not bending back. Keep elbows by your side, bring up and to a point of keeping resistance, try not to swing your body or use your shoulders. TIPS: Have a partner hold your fee, or hook your feet underneath a piece of furniture that will not move. Hold dumbell close to your body, use your abs to lift yourself all the way up to your knees, then bring yourself back down slowly. TIPS: Keep your back on the ground, small range of motion with your upper body.